Been Partying in Mykonos, Y'all Feta Watch Out! Mykonos is the party animal of the Cycladic Islands, Greece’s rebuttal to Ibiza. Unlike Santorini, this is a beach not made famous for it’s jaw dropping scenery or breathtaking panoramas, but rather for its outlandish, wild and anything goes party reputation. 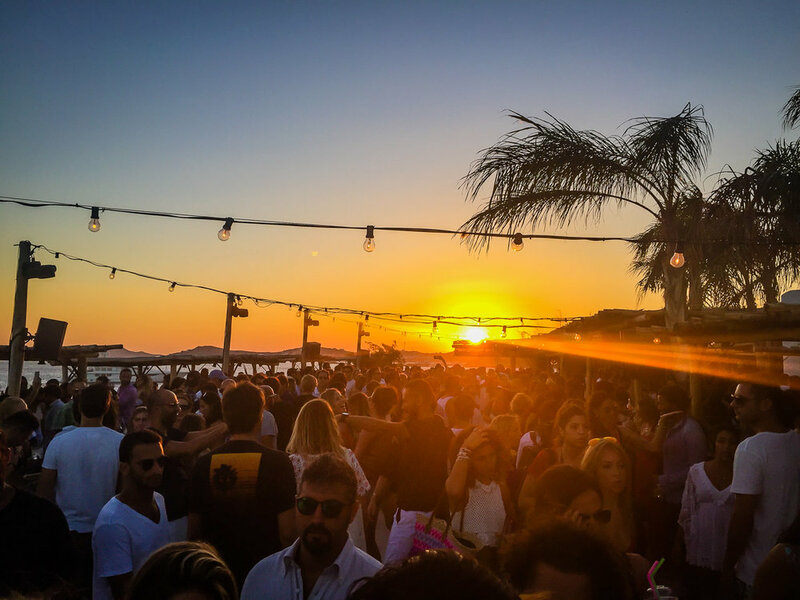 Start early morning in your swimsuit and venture out to the beach clubs and day parties, then immerse yourself in the basslines pounding through the superclubs until dawn. I’m not joking when I say #TeamNoSleep. This island, in addition to attracting numerous young people from different generations, is also a popular destination among gays. 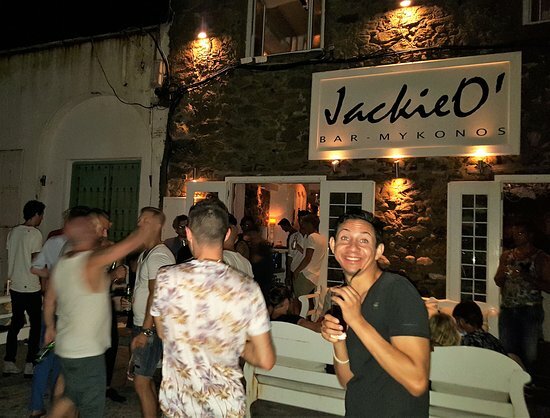 There’s a lot of gay bars that happen to be some of the top bars in Mykonos. It’s super common for people to come up to you and ask if you’re “together” when with the same gender… Nisha and I were like “no, we’re sisters.” But hey, whatever floats your boat! Although my blogs are out of order, we started out our Greece trip with Mykonos which was a smart decision because after 4 days of straight partying, we were finally able to relax on the other islands. We flew into Athens from SFO and took a connecting flight straight to Mykonos. From the airport, we were able to get a taxi to Agios Stefanos where we stayed at the VillaElina Luxury Villas — booked through Airbnb. Mykonos was definitely the most expensive island, the villas were pretty pricey (see prices at the bottom of the blog) but since we decided to ball out this trip, it was worth it. The best thing about this villa was the hot tub in our balcony which we lounged in between our day and night party lifestyle. Ugh, obsessed with this villa! Hot tub in balcony was everything! Views from our hot tub! The best gay bar in Mykonos located on the famous Super Paradise Beach. This bar offers good cocktails, a great selection of music, immersed in a welcoming atmosphere. Jackie O’s is known for it’s exuberant shows with drag queens post 2 AM. If you’re a girl and want to be called beautiful and queen all night or a guy who just needs a self esteem boost, Jackie O’s is the place to be. Toy Room is a club with led lights and loud music—great top 100 hits mixed with EDM. It’s a two-story club but the top floor is a lounge with hookah and cocktails (you have to get invited here so dress nice or just be us jk). The mascot of this club is a creepy bear (I have nightmares) that goes around pouring drinks and giving shots to people—try not to get groped by it tbh. If you suddenly notice the ground begin to pulsate, don’t fear…it’s not an earthquake. It’s just the heavy bass of endless tunes pumping through the mammoth speakers of Paradise Beach Club. This legendary club has parties every day and night ranging from body paint parties to twerking parties to straight up toga parties. Check out their calendar before heading out there to see what treat you’re in for. We went here for a day party which ended up turning into a night party and all I can say is prepare your liver. They give out free drinks and free shots to those dancing a lot and participating in the insane activities and dance-offs—practice your “in my feelings” dance ayyy. Scorpio is located between Paraga Beach and Paradise Beach and is a must visit when you head to Mykonos. The crowd here is entirely different to anywhere else on the island and the price tags show. The best day to go is on a Sunday (super crowded tho) but make sure to make a reservation—this place is NOT CHEAP, 25 euros for an Aperol Spritz, yikes! But if you’re into upscale/bougie vibes, check it out. Traveler Tip: Unlike the U.S., clubs don’t start getting poppin’ till 1 AM, so don’t make the mistake of trying to get there at 11 PM. Honestly, start eating dinner at 11 PM and walk around till 1 AM. Packed 6 swimsuits for a 10 day trip, used them all! The Great: THE PEOPLE. Greek men are the most hospitable, openhearted, and genuine people I’ve ever met. Every club we went to, we were taken care of properly, I don’t think we waited in one line this whole trip. Even when we asked the security guards or promoters for directions to go to another bar (10-15 minute walking distance), they would walk us over there instead of just giving us directions. AND, as soon as we would get to that other bar, they’d talk with the owners and made sure we got VIP seating before they left. As I mentioned in my Santorini blog, Greek men love Indian women from the USA—something about our accents, so really try to finesse your way into getting free things the next time you’re in Mykonos. THE VIBES. I love walking through Mykonos’ narrow pedestrian streets at night—they’re lined with picture-perfect tiny churches, restaurants and boutiques. Everything is just lit up at 11 pm, live music playing all around, people dancing and sipping on cocktails—puts you in the best mood. Honestly, I just love the way the Greek live, positive vibes everywhere! The Good: If I’m being real, I was mostly on a liquid diet so I didn’t get to try a lot of the food places but when you’re walking around town, you’ll see a bunch of cute restaurants that I would just stop by and check out. I craved gelato 90% of the time (damn you, sweet tooth), Trio Bambini is a crepes, gelato and ice cream chain that’s fantastic. Another place we enjoyed eating at was D’Angelo, it’s Mykonos’ main hub for pizza and pasta. They have a pasta gallery, meaning they have every single kind of pasta ready to serve…DREAM COME TRUE—next stop Italy, please! The Bad: I’ve mentioned how transportation in Santorini was horrible, but nothing beats the lack of transportation in Mykonos. There are only 31 taxis on the WHOLE ISLAND. Right outside of town, they have a dinky little taxi station where people wait for taxis post 3 AM, and 1 taxi comes every 20 minutes. We got super lucky because on the first night, we met a local who said he would be our personal driver for our stay. We were able to call him whenever we wanted and he would charge us 10 euros every time to get to wherever we needed to (S/O to you, George!). I would recommend renting a car out if it’s a group of 4 or more, makes it easier to travel around the island. BYE MYKONOS--waiting for the ferry to Santorini! I hope this was helpful to those of you planning a trip to Mykonos and gave inspiration to those who aren’t. If you haven’t already checked out my Santorini or Athens blog yet, you should. If you have any questions, shoot me an email or DM on my Instagram account (@nehaltenany).